The Crested Caracara (Caracara plancus; photo: © K.-L. Schuchmann), a member of the tropical subfamily of Caracarinae, is common in southern South America. This colorful raptor is part of the highly diverse avifauna of the Pantanal, one of the largest continental wetlands of the Americas, where the Brehm Fund, together with the University of Mato Grosso (Cuiaba, Brasilien) – CO.BRA und the Brazilian Science Ministry, Brasilia, supports a mid-term ornithological monitoring project using the latest scientific methods of biodiversity recording. Birds are important bio-indocators for habitat quality and environmental status. Based on exploitation of natural ressources, lack of protected areas and wildering many species have suffered from dramatic population losses during the past decades. 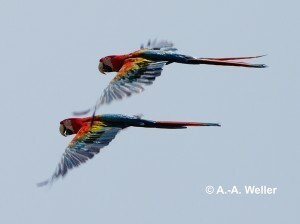 Therefore, since more than 30 years our fund has promoted avifaunistic basic research and conservation measures through various nature and species conservation projects as well as the education of young, highly motivated scientists directed to explore, manage and conserve a globally diverse avifauna. However, the excellent expertise of our competent partners is often paralleled by limited financial means to realize local conservation measures. Please support the Brehm Fund by your donation, membership or heritage in order to promote our sustainable work. It is very worth to invest in the future of our planet – no matter if in Germany, South America or any other place.